This past Monday it was dark, cloudy, and quite rainy. 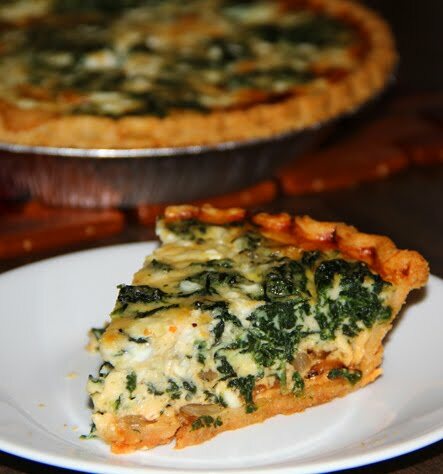 I wanted something filling and warm so I whipped out my spinach & cheese quiche recipe. I originally stumbled upon this quiche in a very old (1998) Weight Watcher cookbook my parents had given me. Hopefully it wasn't a hint! I have found some ways of improving upon it. First, I add cooked onion. It adds a nice sweetness and another level of flavor. Second, I don't make my own crust. I actually use a frozen 9 inch Mrs. Smith Deep Dish Pie Crust. It works so well with the recipe. The catch is it comes with 2 pie crusts so the solution is to double the recipe and freeze one of the quiches. The best part about this recipe is that it is not as dense as your average quiche but it is still filling and satisfying. It is also a much healthier version which is a bonus! Don't let the Weight Watcher label fool you! I know I have been telling Mere about this recipe for awhile. Here it is! Now you have to try it! 1. Preheat the oven to 425 degrees F. In a medium bowl, whisk the milk, cottage cheese, Parmesan, eggs, egg whites, salt and pepper. 2. Place the pie plate on a jelly-roll pan; spread the spinach over the pie crust (if you would like to add the onion this is the time, mix it into the spinach), then pour the filling over the spinach (onion). Bake 15 minutes; reduce the oven temperature to 350 degrees F and bake until the filling is set, 20 minutes longer. Let cool 10 minutes before serving. You may think strawberry with mascarpone Cheese... Yuck! Well, don't be so quick to judge. This indulgence has the texture of a frozen Italian ice, which means it should be scraped, not scooped. 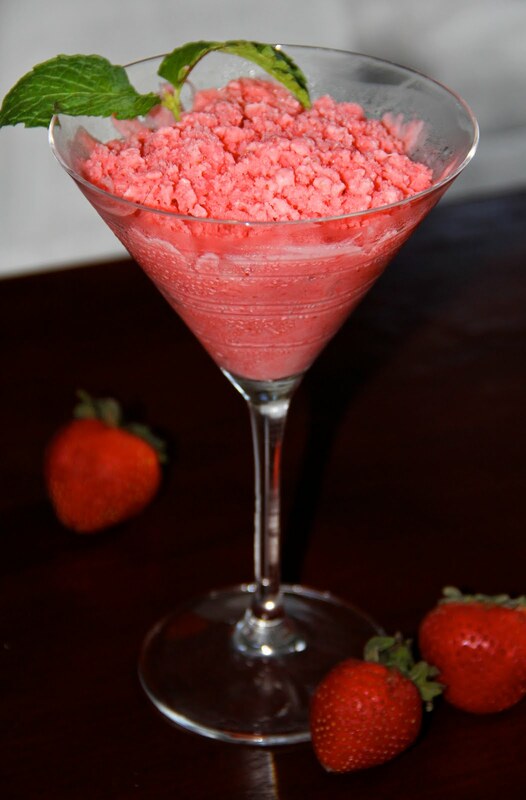 The mascarpone cheese gives it a creamy strawberry creamsicle taste that melts in your mouth. Don't let the name fool you, it does not taste like cheese at all. Another bonus is it is actually made with REAL ingredients. Real strawberries, all natural mascarpone cheese, fresh mint, and sugar. Children and adults will enjoy this healthy alternative to ice cream. I believe if you enjoy fruity sorbets you would enjoy this strawberry delight. Last weekend was hot... unbearably so. Sticky, gross, and in no way the appropriate environment to turn on an oven. So what was a girl to do when she wanted to bake up a batch of cookies for her best friend down in D.C.? 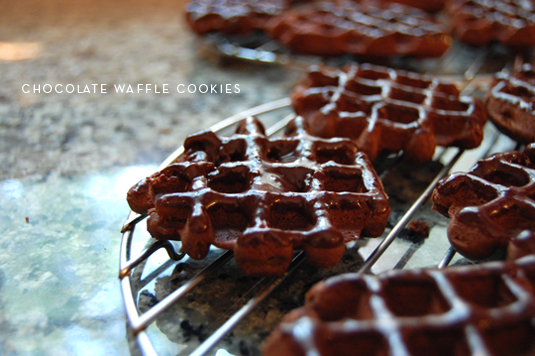 Whip out the waffle iron of course! This recipe wasn't quite as simple as a no-bake option. The prep time took just as long as a regular drop cookie but instead of popping them in the oven and walking away, you had to plow through 4 cookies at a time, about one minute per batch. In hind sight, skipping the oven did make the house cooler, but I was boiling, perched over a searing hot waffle iron for 20 minutes. The results, however, were delicious! The cookie tastes like the offspring of chocolate cake and a brownie. Substantial enough not to crumb and to support the light coating of icing but at the same time so incredibly tender. The healthy dose of cinnamon in the batter really warms up the chocolate and reminds me of babka or rugelach. Not your average cookie and perfect for sharing with my fabulous friends and whoever else joined in the weekend festivities! HOT... HOT... HOT... Heat Wave! The only thing you can possibly do during this excessive heat is eat ice cream! It is a tough job but you gotta do it! One of my birthday presents this year was a brand spankin' new ice cream maker. So what did I do? I made ice cream! 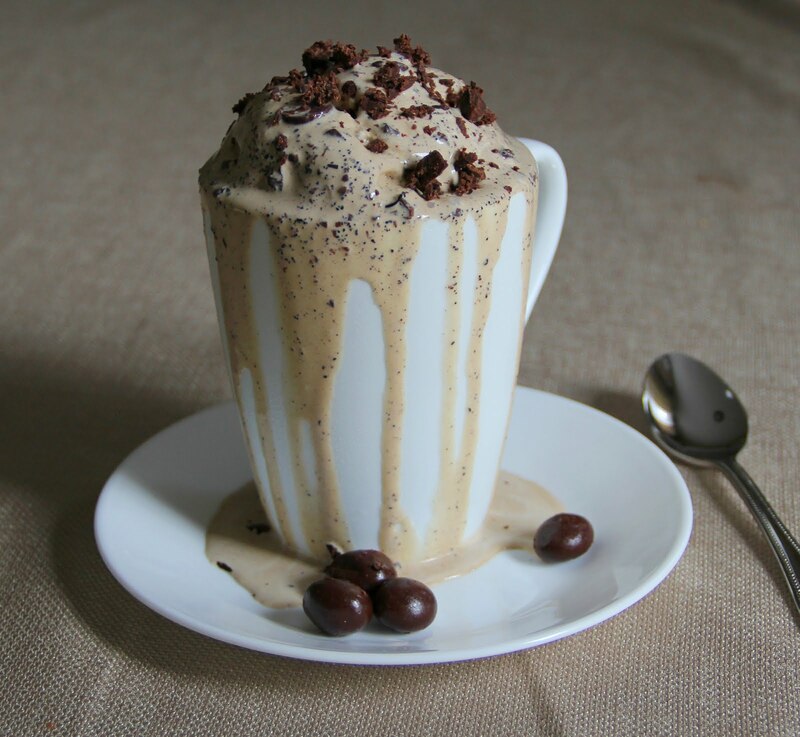 If you love coffee and you love ice cream then this is the ideal ice cream for you. You will LOVE it. The espresso, kahlua and chocolate covered espresso beans make for a decadent treat. I will admit it takes a little bit of time. You need to create a custard and cool it before you are able to use the ice cream maker. I made the custard the day before and whipped it out today for a cool treat. Warning, it is more filling than you think. I hope you try this because it is well worth the treat! So... cool down and perk up with some homemade Espresso Ice Cream! I am now finally getting around to posting some images from Matt's Family Maine Vacation. Unfortunately I only whipped out my camera for one beach day. Kind of upset with myself because there were so many great photo opportunities. There was a lobster boil, fireworks and great family fun. Oh well, we live and learn. 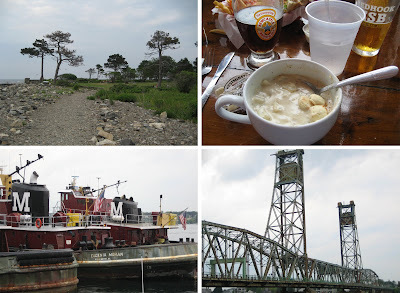 Matt's family vacations in Wells, Maine (Drake's Island). My family regularly vacations in Rhode Island and I must say the beaches couldn't be anymore different. When the tide goes out in Maine you gain about a football field in length of beach. It is amazing. A lot of people then partake in bocce, paddle ball, castle building, soccer/football, and so much more. Matt's Famous Family Vacation beach activities mainly include Bocce, Power Ball and Mound Building. Power ball is a game where you bounce a small ball on the surface of the water to one another. The ball never sinks, just bounces. Doesn't sound all that exciting but it is actually quite fun once you get the hang of it. The other activity, Mound Building, involves heavy duty shovels, work gloves (optional), and someone to sit on the Mound. The men will build a giant mound of sand in the middle of the beach and as the tide nears someone will sit on top of the mound until the tide takes the mound/person away. It is quite interesting. I must say that the people on the beach always enjoy watching. For those of you who haven't experience a Maine beach or Mound Building... enjoy! Matt & I were the first on the beach this morning. mound before the tide started coming in. I just really like this portrait of Matt so I threw it in. Great example of the tools needed to build the mound. He has his work gloves (he still got blisters) and the shovel. This shot just makes me want to jump right in. Especially with this heat wave... wish I was in there right now! This is a shot of the beach from the water. You can see the start of the mound and our chairs in the distance. Look at how much beach there is! Oh boy, can't wait until my RI vacation. Look how beautiful the blues and greens of the ocean are. I just want to jump right in! For some it's the scent of sun screen. 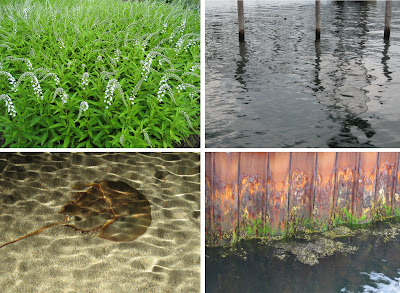 For others it's the taste of a creamsicle or the sensation of wet sand, clumped in your bathing suit bottom. Everyone has something, be it a specific place, taste or smell, that is evocative of childhood summers. 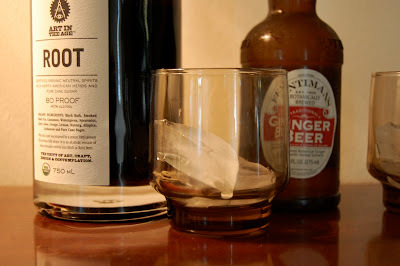 For me it's the cold, painfully-bubbly, first sip of a Stewarts root beer, straight from the long-neck bottle. Summertime at Grandpa's condo meant an exception to the long standing rule that all beverages were to be enjoyed from a glass. You can imagine the thrill when Jess and I were able to sit on the deck next to our pickle jar full of fireflies, bottle in hand, feeling at least ten year's older! Although there's a more adult brew being sipped from a long-neck these days, the appeal of the spicy-sweet treat still brings me back. So when I discovered ROOT, a new liquor with the kick of birch beer but without the sickly sweetness of a schnapps, I had to give it a go for nostalgia's sake. 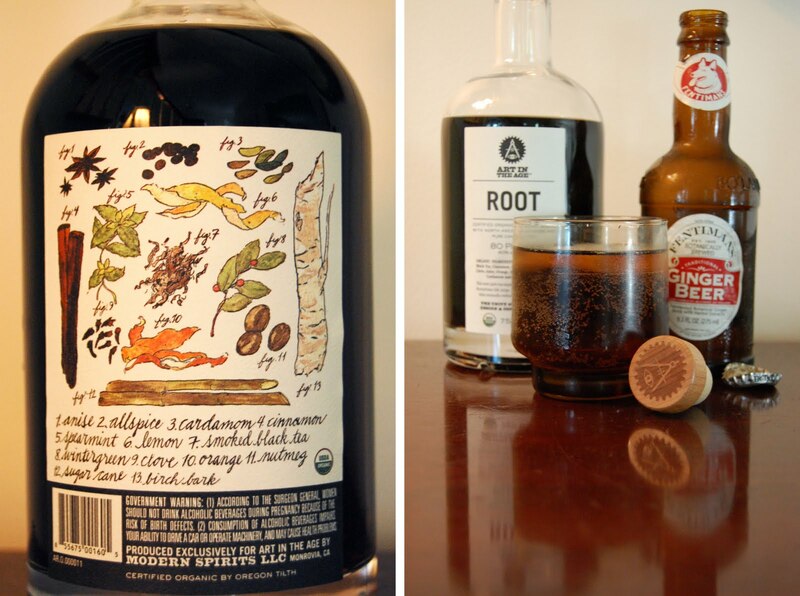 With the bubbly punch of a ginger beer and the earthy spice of ROOT, this cocktail has the sharp, full-bodied flavor of a grown up root beer. Perfect accompaniment to a humid, lazy afternoon. It's never appropriate to arrive at a guest's house empty handed, even if it is your sister's. So of course when visiting up North last weekend a Belated Birthday cake was in order. Knowing that Jess had undoubtedly indulged in something extra chocolaty on her big day, I thought a lighter option would hit the spot. 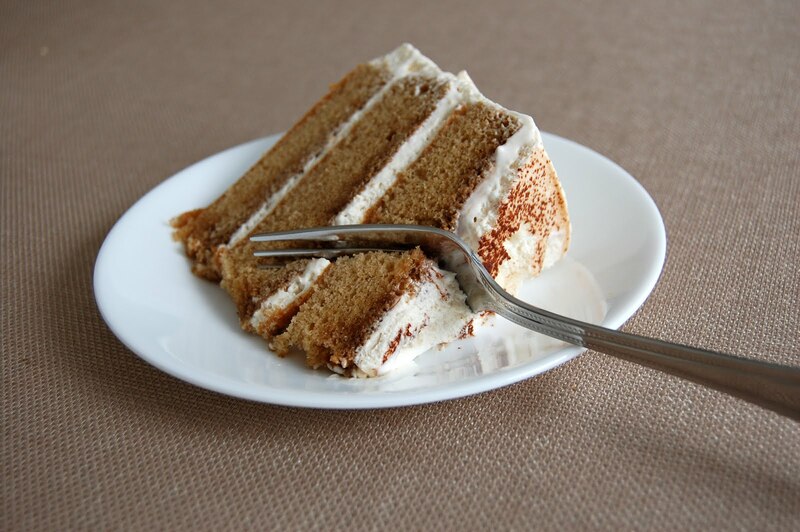 Cue the Cappuccino Chiffon Cake. Three, that's right three, layers of chiffon cake soaked with espresso and Kahlua syrup, topped with fluffy whipped cream and dusted with a touch of cocoa powder. Somehow this caffeinated concoction survived a 4+ hour car trip and it was well worth the risk. Full of delicate coffee flavor (although I'd double the syrup recipe to make sure the layers are extra moist) the final product tasted like Tiramisu's American cousin. But what beat the cake was being able to enjoy it with Jess, Matt, and my mom... while watching Harry Potter and the Women's World Cup of course! My Maine mini vaca is upon me. Every year I try to bring a fun treat or snack for all to enjoy. A while back I had found a recipe in my Food Network Magazine that I had been saving for the right occasion. I felt it was time to whip it out! This recipe was quite easy. Pour all your goodies in to a bowl, heat up the caramel ingredients on the stove, combine the goodies with the caramel concoction, bake it on a couple of baking sheets and viola... Yummy sweet & salty popcorn mix. The recipe makes a lot and it lasts up to 2 weeks so it is well worth the little bit of effort it takes to make. You could even play around with the actual ingredients in the mix. You could try different cereals, a variety of nuts, or anything you think would work well. I always recommend trying the original recipe first before experimenting. 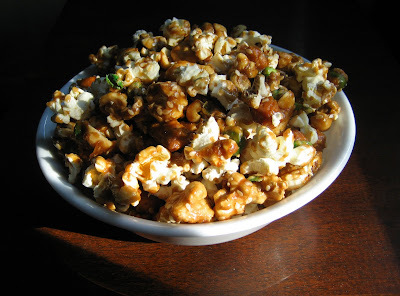 This sweet & salty mix is unlike something I have had before. A lot of different flavor combination's between the caramel, the sesame seeds, and wasabi peas. You will have to try it to experience it. I say grab some friends, a game, some cold beverages and munch away! If you're every craving the flavors of a New Jersey summer up there in Massachusetts, you could always throw together a tomato tart like Mom and I did last weekend! 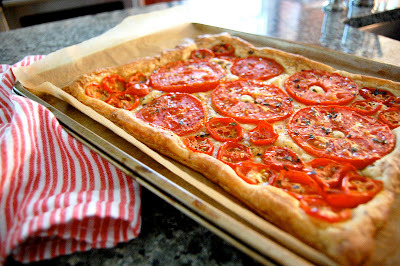 So easy to assemble, using pre-made puff pastry, olive oil, thyme, tomatoes, salt and pepper. That's it. No cheese, no sauces, no fuss. As a result the star of the show can really shine, those big, ripe, jersey tomatoes. I must say I am a pretty big fan on Ina Garten (Barefoot Contessa). Ever since I saw her beach barbecue episode I've wanted to make the Grilled Clams with Basil Breadcrumbs. I had never seen clams made on the grill and let me tell you it is EXTREMELY easy. 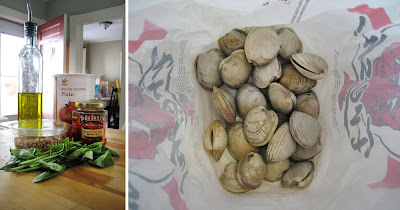 No dirty pots from steaming, you don't heat up the house, and it is really fun to watch the clams open up on the grill! How easy is that? The only thing I would change about the recipe would be more butter and a little less bread crumb. I didn't make my own breadcrumbs because I didn't want to do the work. Maybe the recipe would be a little more enjoyable with homemade bread crumbs. 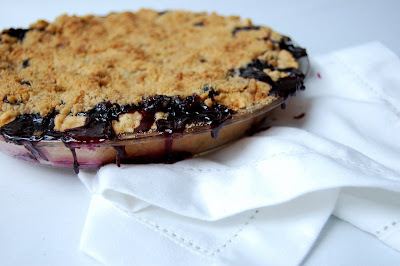 If you are trying to impress I would definitely whip out this easy recipe for entertaining! You can make the breadcrumb mixture in advance and grill away when your ready. Nothing screams summer more than clams. Grab a beer and enjoy! 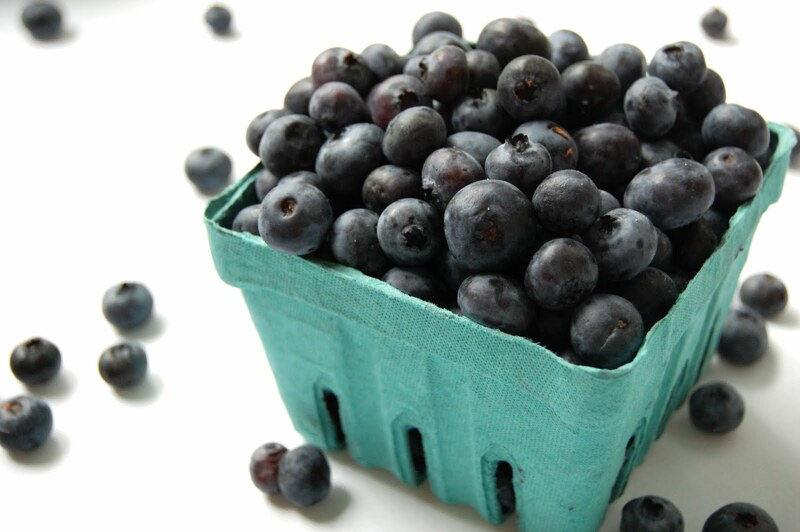 When I came home to find six pints of plump, NJ blueberries sitting on the counter, I knew something had to be done before they were sentenced to a year in the freezer, only to be released when a bowl of oatmeal or batch of pancakes were in need of a little sweetness. Muffins? Been there, done that. Waffles? They fair better with the tiny, Maine variety. Although my crust needed a little extra TLC and the crumb topping could have used an ingredient ratio adjustment (everything's better with a little more butter), I was pleasantly surprised with the results. 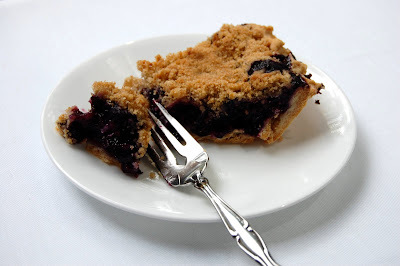 The filling came out firm and chock-full-of blueberry flavor with only a little flour as the thickening agent. Next time I pick up fruit at the farm-stand, I'll make sure to tell Maybelle you say hello... maybe feed her an ear of corn or two. This past Sunday during the 4th of July weekend I took a little day trip with my boyfriend (Matt) and his parents up to Portsmouth New Hampshire. The adorable and historic city is only 40 minutes away and I had never been. It was a real treat! Unfortunately it was a little cloudy and rainy. However, that did not stop us. We walked along the water, viewed the lush gardens, consumed chowder and beers on the water, and shopped until we dropped. I would definitely take another trip up there soon to explore further. The chowder was delicious and perfect for a dreary day. Yesterday I was craving a refreshing summer cocktail. 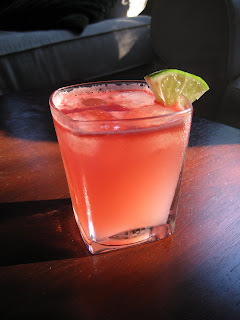 I wanted to try something new so I began my hunt for a new cocktail recipe online. My only requirements were that I had to have all the ingredients already in the house and the recipe needed to have more than 2 ingredients. I finally stumbled upon a Watermelon Gin Fizz! The recipe only requires 5 simple ingredients including watermelon, gin, lime juice, ginger-ale and ice. It is simple, delicious, refreshing, and beautiful. The finished cocktail looks like a gorgeous summer sunset! I highly recommend you try this recipe this summer. You won't be disappointed! Took a little trip to visit some friends up in Seabrook New Hampshire on Saturday. We had gorgeous weather and it was my first official beach day this year. One of the many great reasons to visit New Hampshire is for the FIREWORKS! You can legally purchase them so obviously I had to pick some up during the 4th of July weekend. Planning on shooting most of them off on my vacations to Maine and Rhode Island this summer. I will leave the 4th of July fireworks to the pros this year. Definitely looking forward to some AAH FUN! I hope you are too, Meredith! Maybe we can shoot them off on the beach instead of the driveway like a couple years back (why did we do that?). A closer look at all the goodies. No idea what any of them are.